I saw this article over the weekend, and honestly, I find things like this to be far more encouraging than the “double-dip recession” stories are discouraging. With six children who are going to grow up in “the new economy” (whatever that is), I’m constantly trying to understand how that new economy is going to work, and where the “growth drivers” are going to be. My oldest son is going into nursing, and while, with our aging population (especially here in Pittsburgh) it seems like the medical field will offer secure employment opportunities, it’s not truly a “growth opportunity” in the sense that fixing people is a lot like fixing broken windows. Over the last five years, “America truly has been in the midst of a revolution in oil and natural gas, which is the nation’s fastest-growing manufacturing sector”. No one is more responsible for that resurgence than [Harold] Hamm. He was the original discoverer of the gigantic and prolific Bakken oil fields of Montana and North Dakota that have already helped move the U.S. into third place among world oil producers. Today OPEC’s market share is falling and no longer dictates the world price. This is huge, Mr. Hamm says. “Finally we have an opportunity to go out and explore for oil and drill without fear of price collapse.” When OPEC was at its peak in the 1990s, the U.S. imported about two-thirds of its oil. Now we import less than half of it, and about 40% of what we do import comes from Mexico and Canada. That’s why Mr. Hamm thinks North America can achieve oil independence. It’s true, this is not a high tech growth opportunity, but more of a 19th century-style growth opportunity. Still, it’s a “driver of growth” that can lead to the development of manufacturing, refining, and infrastructure opportunities in the north-central U.S., and along with that infrastructure development will come the need for all the high-tech that goes along with it. Please don’t misconstrue this as investing advice. I don’t have any money now, nor have I ever had any money. But I remember a day not so long ago – in the mid 1990’s – when Apple Computer stock was at $25.00 per share. Don’t we all wish we had bought some of that? Today, after a 600+ point drop, stocks are at a very low point, and gold is as high as it’s ever been. If your goal is to maximize the gains on your investments, to “buy low and sell high,” this is the time to get rid of your gold and buy stock. I tend greatly to discount those who are saying that “a double-dip recession is coming”. The WSJ today has a good article today on why that’s so. There are three fundamental differences between the financial crisis of three years ago and today’s events. Starting from the most obvious: The two crises had completely different origins. The older one spread from the bottom up. It began among over-optimistic home buyers, rose through the Wall Street securitization machine, with more than a little help from credit-rating firms, and ended up infecting the global economy. It was the financial sector’s breakdown that caused the recession. The current predicament, by contrast, is a top-down affair. Governments around the world, unable to stimulate their economies and get their houses in order, have gradually lost the trust of the business and financial communities. That, in turn, has caused a sharp reduction in private sector spending and investing, causing a vicious circle that leads to high unemployment and sluggish growth. Markets and banks, in this case, are victims, not perpetrators. The second difference is perhaps the most important: Financial companies and households had feasted on cheap credit in the run-up to 2007-2008. When the bubble burst, the resulting crash diet of deleveraging caused a massive recessionary shock. This time around, the problem is the opposite. The economic doldrums are prompting companies and individuals to stash their cash away and steer clear of debt, resulting in anemic consumption and investment growth. The final distinction is a direct consequence of the first two. Given its genesis, the 2008 financial catastrophe had a simple, if painful, solution: Governments had to step in to provide liquidity in droves through low interest rates, bank bailouts and injections of cash into the economy. The policy didn’t come cheap as governments world-wide poured around $1 trillion into the system. Nor was it fair to the tax-paying citizens who had to pick up the tab for other people’s sins. But it eventually succeeded in avoiding a global Depression. Today, such a response isn’t on the menu. The present strains aren’t caused by a lack of liquidity—U.S. companies, for one, are sitting on record cash piles—or too much leverage. Both corporate and personal balance sheets are no longer bloated with debt. The real issue is a chronic lack of confidence by financial actors in one another and their governments’ ability to kick-start economic growth. And there’s one more thing. Crude oil prices have fallen to about $81 a barrel. When they were $112, we had $4.00 per gallon gas. The inflationary effects of that increase rippled through the economy, and I believe, with gasoline prices going the other way, we’ll see a similar easing. No, it’s not the best of times right now. But it’s not the worst of times, either. And as our friend Rhology says, “Our God is in the heavens; he does all that he pleases.” Ultimately, we can trust Him. During the last recession, there were a couple of things that were going on that I never expected to see, and these things seemed to lift the economy out of the doldrums at that time. One of them was the ability for homeowners to refinance their mortgages at low interest rates. And I’ve written about privately-financed efforts to do just that in a previous post. Just today the WSJ ran an article on a flurry of mergers and acquisitions that’s taking place. Evidently, corporations have been sitting on huge piles of cash, and now they’re wanting to do things with it that will generate some kind of return. 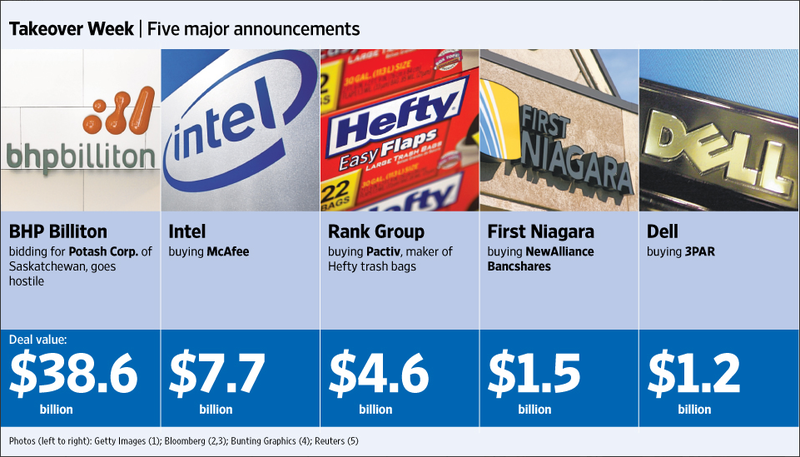 On a day of bleak jobless news and a 144-point drop in the Dow Jones Industrial Average, Intel Corp. surprised investors by unveiling plans for a $7.7 billion all-cash takeover of Internet security company McAfee Inc. That came just hours before First Niagara Financial Group Inc. in Buffalo announced the biggest bank merger since the peak of the 2008 financial crisis, a $1.5 billion acquisition of NewAlliance Bancshares Inc. Both deals pale in size next to BHP Billiton’s hostile $39 billion offer for Potash Corp. of Saskatchewan, disclosed Tuesday. U.S. deal activity had been weak through most of 2010, as corporations husbanded cash and waited for more signs of economic revival. Many of the biggest deals have come in Asia, historically a laggard in the merger game. This week’s moves suggest some executives have grown restless waiting for the broader economy to turn. Nearly $85 billion of transactions have been announced since Monday, the highest weekly sum since the week of Dec. 13, 2009, when Exxon Mobil Corp. announced its $40 billion acquisition of XTO Energy Inc., according to Dealogic data. One factor may be the cash burning in their pockets. U.S. public companies carried $2.03 trillion in cash and short-term investments at the end of the first quarter, according to data from FactSet Research. That’s about 57% above the level at the same tome in 2006. While we’ve been seeing some signals that the economy is trending upward, I think there were some bigger signs that the economic growth is gaining enough traction to be able to sustain a period of growth and employment. The first, last week, was the passage by the Senate, of the “health care bill.” While many small business owners were not in favor of that particular bill, the mere passage of it means that there are some contours beyond which the bill will not go — and that affords stability to the business climate. The second, of course, came in the form of reports that Christmas shopping sales were higher than expected. A late boost from procrastinating consumers and an extra day of shopping between Thanksgiving and Christmas increased total retail sales, excluding automobiles and gas, 3.6% over the year-earlier period through Christmas Eve, according to MasterCard Inc.’s SpendingPulse unit. It seems to me that “retail is the new heavy industry.” That is, whereas some writers have lamented that the US has lost its “manufacturing base,” the new and genuine symbol of the economy is retail, where money and goods change hands. (And “goods” now including a lot of things like software — produce them once, distribute them anywhere). Given that retail sales account for 2/3 of the economy, a 3.6% rise is not insignificant in the current climate. And a third (that I have seen) suggests that corporate optimism was at the highest level in six years. Britain’s business leaders are more optimistic about the UK economy improving than at any point in the past six years, according to an annual survey of captains of industry. In the yearly Ipsos Mori Captains of Industry poll of 100 company bosses, 36 per cent thought that the economic situation would improve, compared with just 4 per cent last year. The FT story goes on to suggest that most business leaders think government policies will not be helpful to the economy. But again, even though these policies may not be helpful, folks know what they are, and can plan for them. These three signs seem to indicate that most people will go into the new year with the expectation of an improving year — that the recession is behind us. There may still be some bumps in the road, and even some significant ones. But on balance, things are moving forward. There are fines attached to the Health Care bill that was just passed by the House. Compulsory health insurance could require nearly 100 million Americans to switch to a more expensive health plan and would therefore violate President Barack Obama’s pledge to let people keep their current health insurance. In particular, the legislation before Congress could eliminate many or all health savings account plans. But … who’s enforcing this? Who’s going to make sure that you have a “qualified health care plan,” and further, who’s checking and enforcing the fines? In Pennsylvania (and other states), there’s a parallel in terms of mandatory auto insurance. But you can drive a long time without it, and if you don’t have an accident, well, you can drive a long time without it. But if you do have an accident, that’s the time when it’s enforced. So too with health care insurance. It’ll be enforced at the time of need. That means some sort of police force or collection agency stationed at hospitals. I just see a train wreck coming ahead if the senate passes a similar bill. There are free-market options to reduce the cost of health care. Are we in for a robust economy? 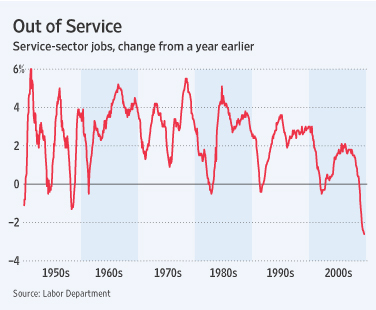 Poised for a rapid job rebound? Robust not only in the sense of a growing GDP, but in the sense of rapid job creation? The WSJ’s Outlook column today seems to be projecting that very thing. … To be sure, even as more companies begin to hire as the economy recovers, it could take years before payrolls reach their prerecession level. With Americans spending more cautiously in response to the massive losses in wealth associated with this recession, some jobs may simply never come back. But the biggest reason jobs might bounce back quicker from this downturn than the past two recessions, said Comerica Bank economist Dana Johnson, is that the economy looks likely to see a much bigger bounce as it recovers. Gross domestic product — the value of all goods and services produced by the economy — has fallen by 3.9% since economic output peaked last year, marking the steepest decline since the end of World War II. In contrast, the 2001 and 1990-91 recessions were among the shallowest on record. History says that given the depth of the downturn, GDP should grow at a 6% to 8% rate over the next year, according to Mr. Johnson. But because of the financial stress that has come with this recession, he expects it will grow at a 4% rate. Corroborating that notion, the Journal this morning carried stories that car sales have been very strong in both India and China over the last six months. In fact, General Motors set a new monthly sales record in China in July.